· The program was organized by Lung Care Foundation to Create Awareness About Ill-Effects of Pollution on Lung Health and motivate individuals to People Driven Solutions. · President of India, Shri Ram Nath Kovind ((in a message) expressed his joy on this initiative of "Sankalp Se Siddhi Programme for Clean Air" being organised by the Lung Care Foundation. · Honorable Prime Minster Shri Narendra Modi (in a message) congratulated Lung Care Foundation on this unique initiative in galvanizing the support of the youth and creating awareness on a vital subject, which impacts every individual. § The event was graced by H.E Lt. Governor of Delhi, Shri Anil Baijal, Shri Anil Swarup, Secretary, School Education, Government of India, top officers of BSF and Delhi police, Senior Lawyers of Delhi High Court and Supreme Court and CMDs of many PSUs. 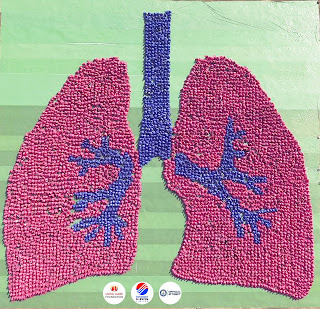 The program also witnessed one-of-its-kind activity, where Lung Care Foundation brought forward 5100 plus school children from 35 plus schools from Delhi-NCR to form the largest human image of an organ (lung). This image has created history and has been awarded by the Guinness World RecordTM of creating the ‘largest human image of an organ’. With the help of choreography with 5000+ school children, the lung formation further transformed to show the effects of pollution: pink lungs turning into irreversible black lungs. Not only this, through this campaign Lung Care Foundation aims to bring in a people movement where, the citizens, corporates and children come together to start a new revolution “#MySolutionToPollution” of green ccommitments. Congratulating on the success of the event and achievement, President of India, Shri Ram Nath Kovind, (in a message)extended his warm greetings and felicitations to all Children who took the pledge to work for a cleaner environment as a people's movement. He further expressed his joy on this initiative of "Sankalp Se Siddhi Programme for Clean Air" being organised by the Lung Care Foundation. Adding to this, the Prime Minister of India, Shri Narendra Modi, (in a message) said, “It is a pleasure to know that the campaign ‘I care for Lungs’ is being launched by the Lung Care Foundation in Delhi to create awareness against air pollution and related lung disorders. Congratulations for organizing the unique initiative in galvanizing the support of the youth and creating awareness on a vital subject which impacts every individual”. Sharing his thoughts on the occasion said, Prof. Dr Arvind Kumar, Chairman Centre for Chest Surgery, Sir Ganga Ram Hospital and Founder & Managing Trustee, Lung Care Foundation “With 1.2 Million dead, India saw world's most pollution-related deaths in 2015, says Lancet Commission study. We believe it’s time that the citizens themselves takes care of their action and be responsible in their deeds. We are confident that our I care for Lungs program clubbed with Governments initiative of “Sankalp Se Siddhi” (Attainment through Resolve) will bring change in the country for the betterment of country’s economy, citizens, society, governance, security and other verticals”. The program was based on Dr. Arvind Kumar (Founder & Managing Trustee Lung Care Foundation) vision of reaching the Pink Lung- Black Lung image to the last man in the village, it was conceptualized by the youngest Trustee & CEO of Lung Care Foundation, Abhishek Kumar and Presented by Mr. Rajiv Khurana (Founder Trustee). Corporates like Petronet LNG, GAIL, IOCL, BHEL, NBCC, NTPC, Sonalika Tractors, Droom, Oyo Rooms, Paytm, Aditya Birla Group have come together to associate with this World’s largest air pollution awareness program – ‘I care for Lungs’ and also committed to one measure each. The program’s title sponsor was Petronet LNG which is working towards changing the majority of HMV running on Diesel to LNG (A clean fuel). Prof. (Dr.) Arvind Kumar is a leading Thoracic Surgeon who has been practicing Chest Surgery for the last 35 years. He has been a witness to changing colour of the lungs of people over the years. When he operated patients with lung diseases in the 1980s, colour of the lungs of a non-smoker in urban India was found to be pink whereas black spotted lungs were typically found to be only among the smokers. However, now after 35 years and countless Chest Surgeries later, he is observing a shocking site wherein lungs of most of the residents of urban areas like Delhi resemble smoker’s lungs. The site upset him severely and he kept talking about it to others. Dr. Kumar thought that since he has been a witness to this unfortunate change (that others can’t see), it is his duty to share this information with all the countrymen and work for the ‘Care of 2.5 billion Lungs in India’. He shared this vision with Mr. Rajiv Khurana, Dr. Belal Bin Asaf and Mr. Abhishek Kumar and this was the beginning of ‘Lung Care Foundation’. Mr. Rajiv Khurana, is the CEO & Founder, The Personnel Lab; Founder, RETYREMENT and Founder & Managing Trustee, International Consulting Professionals’ Institute (ICPI). He has over 36 years of Industry and consulting experience in corporate world. He is an International Consultant & Trainer, Venture Mentor, Executive Coach, Author, Blogger and Social Entrepreneur. He is the author of 9 books and over 2000 columns & articles for newspaper. He is also a regular TV guest and Vlogger for Career Shows. Dr. Belal Bin Asaf has been actively contributing in the field of Medical Sciences for more than 10 years. Presently, he is a Consultant at Centre for Chest Surgery, Sir Ganga Ram Hospital and has a vast experience of providing surgical care to patients suffering from various chest diseases. He is an established Thoracic Surgeon with special interest in managing lung cancer and is an expert in minimally invasive (keyhole) surgery for lung cancer. Abhishek, is a young passionate citizen of Delhi, with a keen desire to serve the society.